Follow these instructions if you have an existing site that you want to completely rebuild. We can provide you with a development space to use for the two days or you can follow the steps below to work on your own development space. Click on each link in the list below for detailed instruction. 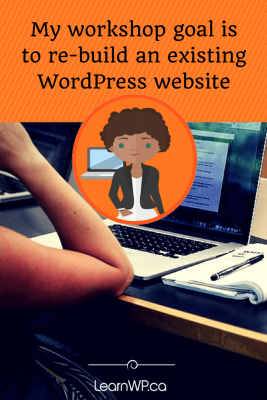 We can provide you with a temporary WordPress installation (NOTE: We are not using wordpress.com this is a self-hosted WordPress installation. WordPress is installed on your web hosting account. It is not a program on your computer.) You may be able to use this space for a 2-3 weeks after the workshop. We reset the sites before our next workshop. You can contact your existing host and ask them to clone your existing site to a staging area where you can work. If you plan to change the images for your site, bring them. Download Chrome for a better workshop experience. Please do not use Internet Explorer for the workshop. Please make sure your laptop is functioning well and don’t forget to bring your power cord to the workshop! If you complete all these steps you’ll have everything you need to have an excellent workshop experience. Email us if you need help along the way.